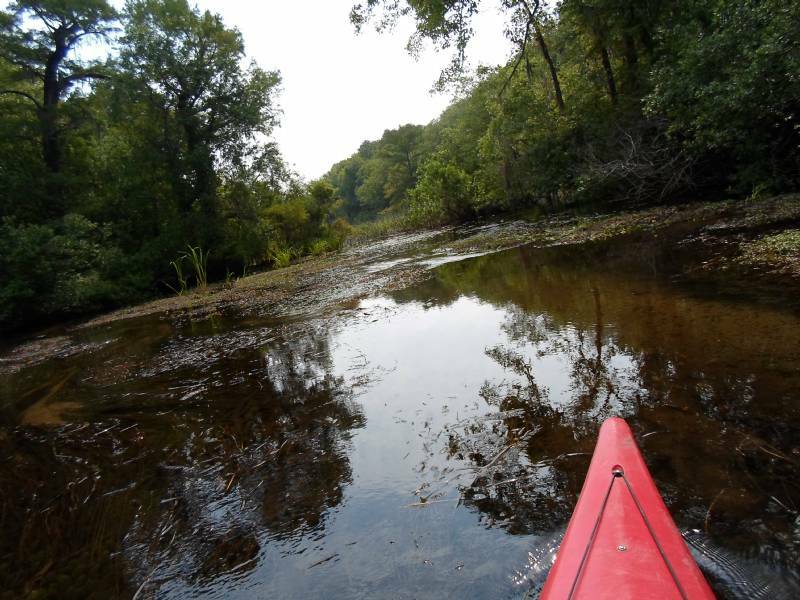 This is a five mile run from a private landing (open to paddlers) in SW Jackson County. Paddlers start by paddling upstream to Black Spring, a river rise for Dry Creek, and following the water out into Spring Lake and then downstream into Dry Creek. (Private Property) The put-in is on private property on Mysterious Springs Rd. South of Marianna, Fl. You need to get permission to paddle here. (Dry Creek (upper 5 miles)) This is a great trip. On a hot day nothing beats a paddle in a tree covered clear creek. This was a work trip to move some of the limbs and sand that would make the trip less fun it they had remained in the river. (Dry Creek (upper 5 miles)) Dry Creek is a tributary of the Chipola River about 7 miles South of Marianna, Florida. (Dry Creek-upper 5 miles) This is a gem of a creek in Jackson County. The creek has clear water and lots of wildlife if you are quiet and yes a few reptiles. Check out the pictures from previous trips. Do you want to add a report to Dry Creek? Glad you finally got to do that trip and on a fine day! And who would have thought when we paddled in late February that so many flowering plants were on that creek? For alligators, though, as you well know, you can't beat the Little River. From SR 276 you go to CR 167 and then to Mysterious Springs Rd. Location by paddlesolo, last updated on 8/2/2014. It has been viewed 3109 times and has 11 posts.